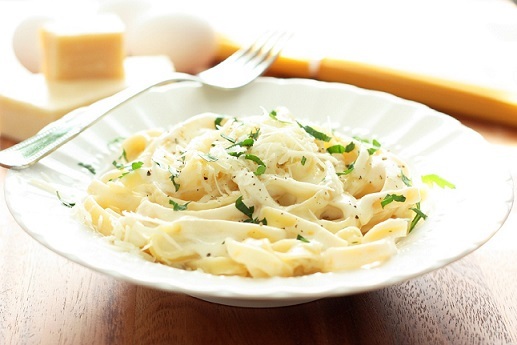 I remember introducing Fettuccine Alfredo to my small town American restaurant customers over thirty years ago. The first night I didn't sell any. The next evening my servers sold "noodles in a delicious garlic cream sauce." The word "pasta" is Italian for paste, meaning a combination of flour and water. The semolina is mixed with water until it forms a dough. 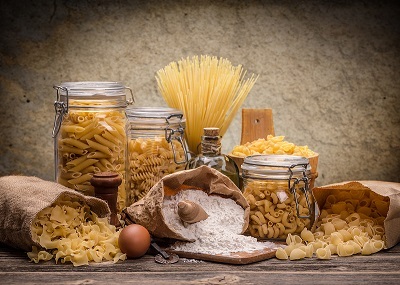 If any other ingredients are being added to the pasta, such as eggs to make egg noodles, or spinach or tomato to make green or red colored pasta, those ingredients are added during the mixing process. The dough is kneaded until it reaches the correct consistency, and then it is pushed through a metal disc with holes in it. The size and shape of the holes in the disc determine what the shape of the pasta will be. The pasta then goes through large dryers which circulate hot, moist air to slowly dry the pasta. 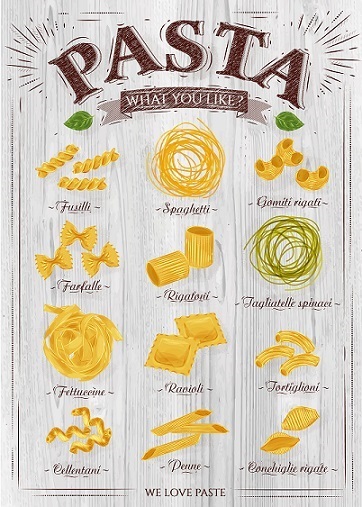 Because different pasta shapes (there are over 600) vary in degrees of thickness, they dry each type for different lengths of time. Most take about 5 or 6 hours to dry. The dried pasta is then packed in bags or boxes, ready for market. What Pasta Should You Use? 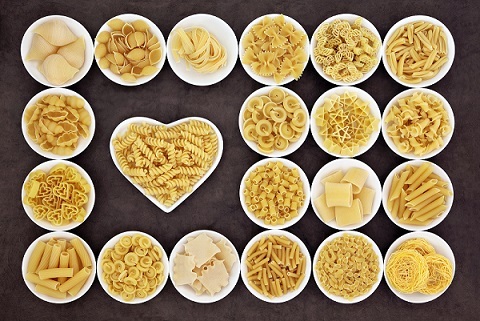 When making pasta dishes, choose a pasta shape and sauce that complement each other. 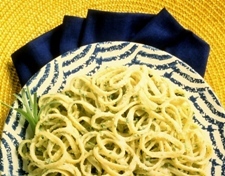 In general, thin, delicate pastas like angel hair or thin spaghetti, should be served with lighter, thinner sauces. Thicker pasta shapes, like fettuccine, work well with heavier sauces. Pasta shapes with holes or ridges like mostaccioli or radiatore, are perfect for chunkier sauces. 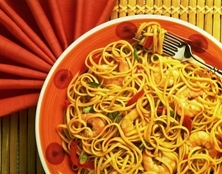 (Angel Hair, Spaghetti) Spaghetti pairs well with just about any kind of sauce. The large diameter, combined with the ridges that Penne & Rigatoni bring, make them ideal to retain sauces on the entire surface, inside and out. 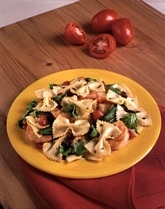 Versatile Shapes (Farfalle, Elbows, Bowties, Pipette, Small and Medium Shells, Fiori, Rotini) Traditionally, these shapes are used widely in American-inspired pasta salads and in the American favorite macaroni & cheese. Chunky fish/meat-based sauces (Farfalle, Elbows, Bowties, Pipette, Small and Medium Shells, Fiori, Rotini) Traditionally, these shapes are used widely in American-inspired pasta salads and in the American favorite macaroni & cheese. All pastas are not the same. 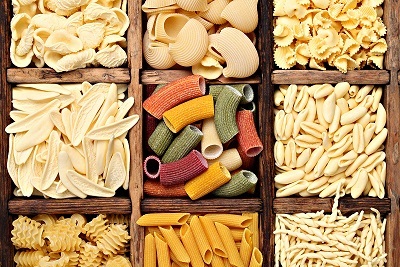 Here are some tips to help you when you are purchasing and cooking pasta. When shopping, look for a golden, amber color - a sign of good quality wheat - versus whitish, reddish or grayish hues. Good quality pasta should not have specs (blackish marks). Good pasta should cook “al dente” every time for the best meal experience. “Al dente” simply means that the finished pasta should be firm (not mushy) when it is ready to be eaten. Pasta that is made with the highest-quality durum wheat should not release a lot of starch in the cooking water. Look to make sure the cooking water is clear versus cloudy - an indicator that excess starch is being released, which usually results in sticky, clumpy pasta. Pasta made with the highest-quality durum wheat should not break, clump or stick when cooking. Serve immediately to ensure the best meal experience. Pasta, particularly long cuts, should be springy and lively, not limp, and should always hold its shape. Always use a large pot. Use 4 to 6 quarts of water for one pound of dry pasta. Pasta needs room to "swim." Cooking pasta in plenty of water is one key to ensuring perfect results. Add the pasta gradually, stirring at the same time. Keep the pot at full boil the entire time the pasta is cooking. Pasta should not be simmered. Stir the pasta occasionally during cooking, to prevent sticking. Do not cover. Always follow the package directions for cooking times. Each manufacturer has tested their brands and shapes for the best cooking times. If the pasta is to be used as part of a dish that requires further cooking, slightly under-cook the pasta. Use a long-handled fork or spoon to taste for doneness. Please remember, perfectly cooked pasta is "al dente," or firm to the bite, yet cooked through. How Much Should I Cook? To reheat cooked pasta, portion out the amount you need and place in boiling water. For easy draining, place the pasta in a stainless steel colander or strainer and then submerge it in boiling water. 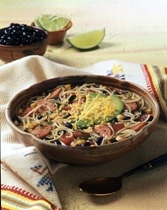 Count 40 to 60 seconds of re-heating time for a four-ounce serving. Drain the pasta well, toss with sauce and serve immediately. Pasta can also be reheated in the microwave oven (carefully, a little at a time stirring frequently). I must tell you about pasta. Pasta is not fattening. If you eat too much of any food, you can gain weight. But according the USDA, a 1/2 cup serving of cooked pasta contains a mere 99 calories, less than half a gram of fat, and less than 5 milligrams of sodium. What about pasta that is whole wheat? Is whole wheat pasta better for you than regular pasta? Some whole wheat pastas offer slightly more fiber, but if you eat regular pasta with healthy, fiber-rich accompaniments like vegetables and legumes, you’ll get everything you need. Besides, some pasta lovers do not care for its taste or texture. 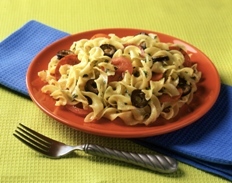 About Pasta - We Are Blessed - Specialty Pastas and Recipes Abound! 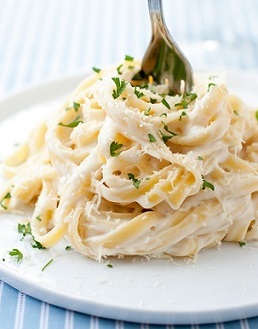 Enjoy the pasta dishes you make and the company of those you share them with! You do share, right?